CrossFit is recognized as one of the fastest growing high-intensity functional training modes in the world. However, scientific data regarding the practice of CrossFit is sparse. Therefore, the objective of this study is to analyze the findings of scientific literature related to CrossFit via systematic review and meta-analysis. Systematic searches of the PubMed, Web of Science, Scopus, Bireme/MedLine, and SciELO online databases were conducted for articles reporting the effects of CrossFit training. The systematic review followed the PRISMA guidelines. 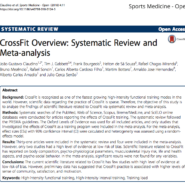 The Oxford Levels of Evidence was used for all included articles, and only studies that investigated the effects of CrossFit as a training program were included in the meta-analysis. For the meta-analysis, effect sizes (ESs) with 95% confidence interval (CI) were calculated and heterogeneity was assessed using a random-effects model. Thirty-one articles were included in the systematic review and four were included in the meta-analysis. However, only two studies had a high level of evidence at low risk of bias. Scientific literature related to CrossFit has reported on body composition, psycho-physiological parameters, musculoskeletal injury risk, life and health aspects, and psycho-social behavior. In the meta-analysis, significant results were not found for any variables. The current scientific literature related to CrossFit has few studies with high level of evidence at low risk of bias. However, preliminary data has suggested that CrossFit practice is associated with higher levels of sense of community, satisfaction, and motivation.